You & Me against the world. Hey there, it is Mary-Ann here, this is the perfect title in my house this week. Ever have those times when you just have to pull together are count your blessings? May times, they are right beside you. I think this little sentiment will be encouraging to my husband Monday. I am going to close it into his laptop and when he opens it, it will be a pleasant surprise! It's better than jumping out of a cake!!! The color pallet is soft and inviting. It can be given today, or to your valentine. There are endless possibilities to these nesting hearts. I believe they will be holding glow sticks for Valentine's Day at school in a couple weeks! The nesting hearts and sentiment are both from Wplus9 which can be purchased by clicking here. Yes, they are perfect for Valentine's Day, but I can see them on a thinking of you card, a note to a friend, a card of encouragement or even on a scrapbook layout. I hope this card encourages you to send a note to someone important in your life today. 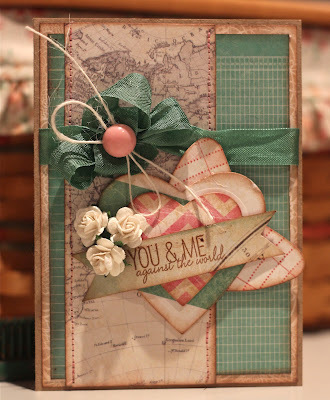 This is a beautiful card, I just love the color pallet. A really beautiful card and a lovely surprise for your hubby. What an absolutely enchanting card, the colours are lovely! Oh my giddy aunt Mary Ann,loooove your card!! wow, this is beautiful. totally love the color combo. What a beautifully designed card! Love the colors! What a gorgeous card! And for your husband? That's awesome! Catching up on my comments. This is absolutely gorgeous. I love the colors and the whole "feel" of this card.